Vamos has a popular Facebook & Webpage with up to date info on road closures, etc. We have been going to Costa Rica for years. I thought that the hassles of renting a car were just part of the less-than-pleasant aspect of travel in Costa Rica. We were tricked, lied to, reservations 'lost', overcharged, etc by most of the larger franchised rental car companies. That alone kept us searching for a better rental car service. We finally found Vamos Rent-a-Car, and it has been an absolute pleasure to deal with them on every trip. When I was putting this project together, I wondered if we could get any support from inside Costa Rica. I immediately thought of Vamos and sent an email off to them describing our project. Within minutes...literally...I received word back that they "would be honored", to sponsor a camera. Thus the "Vamos Camera" was born. This camera is a Bushnell Trophy Camera. It was set to take two images when triggered. The camera was located a a place we call "Three Sisters". The trail forks near three huge trees(the 3 sisters), the left trail goes up to the ridge up near the Walkabout camera and the right trail meanders through the forest and eventually winds up near the lower pasture where the Pippin Cam and the Mono Precioso Camera(upcoming) cameras are located. 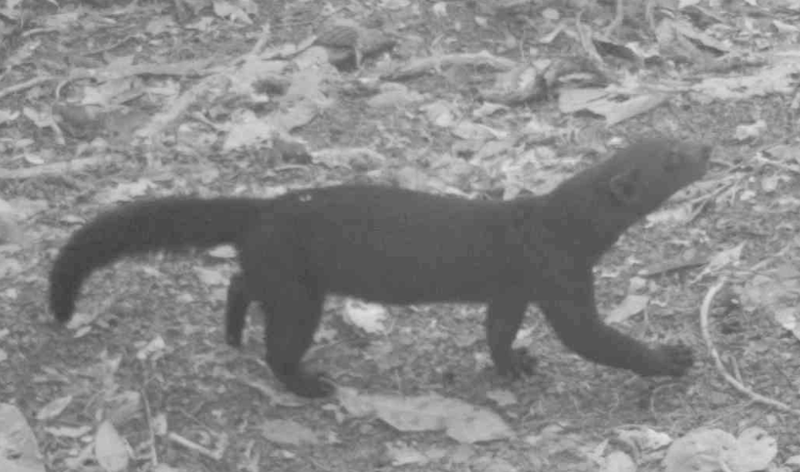 The Tayra, always in motion. I originally thought Tayra, but this is the Jaguarundi. Mystery animal #1. What do you think it is? Mystery animal #2. What do you think it is? Mystery animal #2, a second later. What do you think it is? The technology exists to receive live(+ 3 minutes) text or email images from the new 2014 model cameras. Contact me at OchoVerde@gmail.com, if you are interested in participating in this type of project. A few of us could 'split' a camera. The images can be sent to up to 5 numbers/email addresses. We could start it in July, 2014. For you camera trap junkies(like myself), here are all 3207 images in a quick video, 0.2frames/second. If you see something interesting, let me know and we can investigate it further/zoom in. In addition to what is listed above, there will be: squirrels, lizards, tinamou, dove, common opossum, spiny rat, crab eating raccoon, white nosed coati, etc. The Russ B. Memorial Camera is a Moultrie 880i set in photo mode. It captured over 2400 images over 168 days on one set of batteries. The Russ B. Memorial Camera got quite a few animals. However, there seemed to be an abundance of Great Curassows. The big male is seen criss-crossing in front of the camera, occasionally displaying with his wings, crest, and tail feathers. There are a few females around as well. Two ladies on a stroll. So just how do I go through so many photos to pull out the best ones? I download the images into iPhoto. I can rapidly pass through the images and am able to 'see' changes from image to image. This helps locate where the animal is in the frame. Make random stops while viewing the above video and you'll see how often nothing appears in the single frame. The technology exists to receive live(+ 3 minutes) text or email images from the new 2014 model cameras. Contact me at OchoVerde@gmail.com, if you are interested in participating in this type of project. The BellaRex camera is a Moultrie 880i. We had it set to take 30 second daylight videos and 20 second night time videos. It took over 200 videos during the life of the batteries. The camera still ended up with some nice highlights of ocelots, tayras, curassows, a hawk, and tail-less Spiny Rat with a baby that had a tail. The camera's firmware has been updated and it's rolling now up on a high trail. Below is the compilation video. Note: it has natural sound. The technology exists to receive live(+ 3 minutes) text or email images from the new 2014 model cameras. Contact me at OchoVerde@gmail.com if you are interested in participating in this type of project. The Pippin camera was the final sponsored camera. The contribution for Pippin pushed our fundraising project over the top. It is a white flash day/night color camera. Although it has daytime video capability, we opted to keep it in photo mode for the duration of its term. Pippin cam took 540 photos and lasted from July, 22 to October 27. This camera was moved near the end of our stay in July to a trail near the Mono Precioso camera. It bordered lowland pasture and was at the base of the mountain. Looking out, there is pasture beyond the lens and on the camera's right. To the left and behind the camera is a gradual to steep incline up 200 meters. We were very pleased with the clear images. This agouti is is just one of the many critters that liked to cross the downed tree. Here is our common opossum. In 32 minutes, a spider web is finished. Originally, I thought this was a male Great Currasow. Closer inspection yielded that it was a Black Vulture. Here is the male Curassow. Another pass of the male Curassow. A Capuchin Monkey came for a visit. A chubby Paca. Just one of many that wandered by. 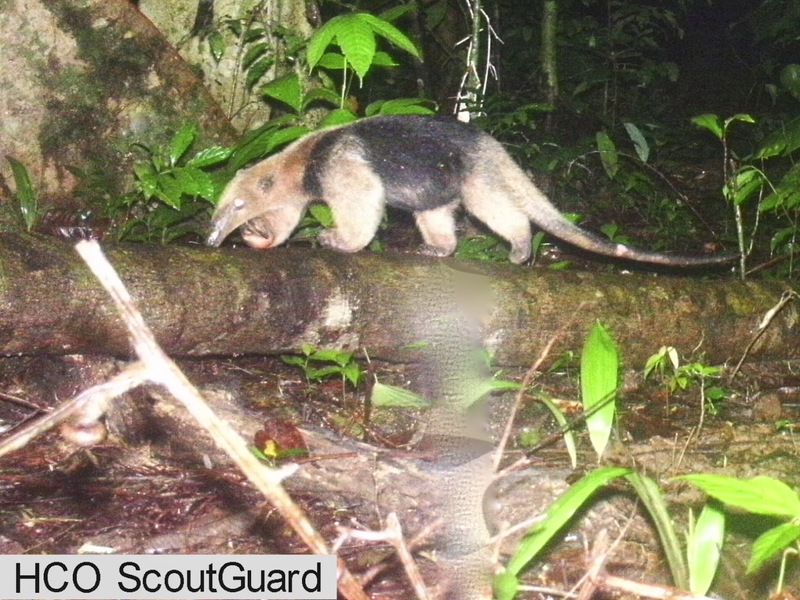 This was one of several anteaters that passed by. Tail markings help identify individuals. Here's the 'barefooted' Crab Eating Raccoon. A Green Iguana used this as his hangout for a while. The Tayra was seen crossing this log many many times. 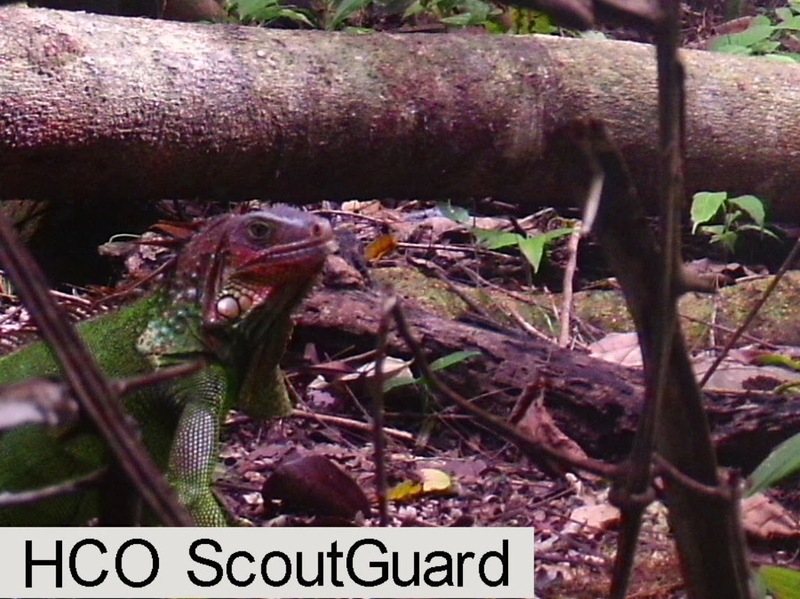 We even saw him once with a large male iguana in his mouth. We think this ocelot is a young one. We think this is a young ocelot. This is a different individual. It has different neck stripes. This is a big Ocelot. A closer look shows what looks like an injured front leg. Here is another muscular ocelot. This is a different individual from the one with the injury. When we changed batteries, the Pippin cam went berserk. It began to uncontrollably flash and not take any pictures. It made a trip back to the USA and was sent off for warranty replacement. Pippin has a surrogate camera snapping away while looking right at that fallen log that these animals enjoy visiting. As the batteries ran down...we got a crazy rainbow shower. Update: March 14, 2014: The sponsor of this camera passed away yesterday at the age of 90. Libby was a natural history enthusiast who was active in Audubon societies where ever she lived. She worked with researcher John C. Lilly at his dolphin communications lab in Miami in the 1960's. She also wrote several books on natural history. We got an email from her in early February saying how much she was enjoying the 'critter cam' updates. Thanks, Libby, for supporting our project!